With a high seed on the line, Ryerson gave Carleton three quarters of solid basketball, but a pressing defence and lack of ball movement buried the Rams. Before the game, Roy Rana told OUA Today that his team would have to be nearly perfect to beat the Ravens. For large stretches of this game, they were, but a slow fourth quarter was their undoing. Carleton jumped out to an early 11-2 advantage with Ryerson settling for jumpers. But the Rams would steady quickly, employing the athleticism of Jahmal Jones and Aaron Best to attack the rim and get lay-ups. Teams would exchange runs, but Ryerson held an 18-17 advantage. They would extend their lead by-way of an inconsistent Ravens defence. Carleton's Dave Smart was switching most screens but his team struggled to contain the ball handlers. They weren't getting much on offence either, with Rana rolling through his near-endless amount of lengthy players to stymy the Carleton sets. Phil Scrubb struggled to find his shots and the rest of the roster was asked to pick up the slack. Ryerson dropped 44 to Carleton's 38, making the OUA Final Four double-upset a real possibility. But the third Q saw Ryerson waver and the cracks in their foundation began to show. Carleton began to move the ball a lot better in the third, finding players all around the court for good looks. To their credit, Ryerson continued to score but when Carleton's clicking, it takes an exceptional offence to keep pace. The Rams saw their lead slip to only one with one quarter left. The fourth was owned by Carleton, with an assist from Ryerson. The Rams were playing well and scoring easily because they attacked from a variety of spots and shifted Carleton's defenders. In the back-end of the fourth, multiple possessions saw the ball stick with Jahmal Jones and ask him to essentially create one-on-one. Jones played so well in this game, but asking anyone to single-handedly beat the Ravens is simply too much of a task. There was also the fourth-quarter Scrubb show. The Phil-Tommy pick-and-pop had been bottled up until the fourth. It broke open in what would be the final stanza, with Phil making great decisions when driving. Tommy drew so much attention because of his solid offensive night. His methodical post play gave the smaller Rams line-ups fits and turned out to be the main offensive avenue in the second half. The night was capped with one of the best plays I've ever seen Phil Scrubb make. In the final three minutes or so, Phil drove from the left wing on Adika Peter-McNeilly. The defender didn't provide much resistance and Phil rose up to attack the basket ... and attack he did. The fifth-year threw down a massive dunk on the retreating Ram to push Carleton up seven. The dunk wound up being the lowering of a casket containing Ryerson's Wilson Cup hopes. Now, Carleton got the win and their ticket to nationals, but this doesn't mean this was all positive for them. Phil played all 40 minutes and only shot 5-21, including 0-6 from three. Tommy shot 13-23 (! ), finishing with 31 points and 12 rebounds. His minute total ended up at 39. Smart has pushed these guys to similar minute totals in previous tournament runs though, and Phil's dunk came when you think he would be most exhausted so ... this may not be a storyline. Connor Wood played a big role in this win too, keeping the Carleton afloat and picking up key rebounds. The three-point shooter turned all-around swing player dropped 20 points while finishing with six rebounds. Ryerson's Jahmal Jones played well tonight, especially when you account for the bad shots he was asked to take when the team was in desperation mode. His 11-25 shooting for 28 points exposed Carleton's perimeter defence and it will be interesting to see how teams attack the Ravens at the Final 8. Carleton plays Windsor in the 8 p.m. Wilson Cup final while Ottawa plays Ryerson for bronze. A win for Ottawa would eliminate the little-doubt about their at-large worthiness. Let's look at the rest of the country! Victoria beat Fraser Valley in a blowout, 86-61. I couldn't watch this one so I don't have much to say. Sorry. I will link to a CanWestHoops piece (and other articles I can find) on @TheCISBlog in the morning. Sask and UBC played a tighter affair, with Sask pulling away in a back-and-forth final quarter. The Huskies make it to nationals with their 81-75 victory. I watched that fourth quarter and I'm curious of how often Vic or Sask (or CanWest at large)use zone defence. If you're reading this and know about the defensive tendencies, I'd love to talk. RSEQ's final is between Bishop's and McGill. Winner will get the 5 or 6 seed. Which brings us to bracket talk. Okay. 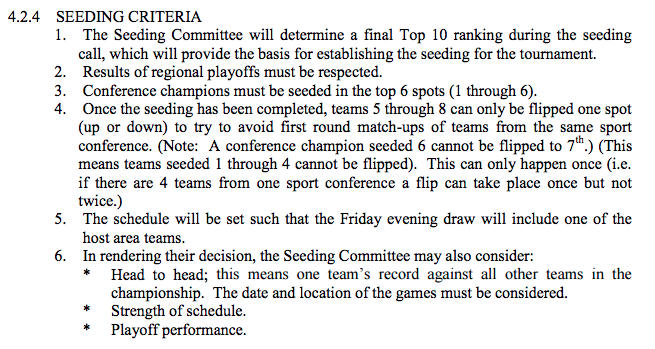 Here's a screen-shot of the (illogical) CIS seeding criteria. Based off this, here's my guess at the seeding. Ottawa is pretty high there, but putting them at 7 would mean we would see them play either Windsor or Carleton in the first round. The Gee-Gees loss gives them an arguably easier game in the first round of nationals, which ... well, yeah this is really looking good for the CIS! Great job! 7 and 8 can be flipped to avoid a rematch from the OUA Final Four, depending on the Wilson Cup result. Okay, that's all I have from tonight. If you think you can build a better bracket ... A) you're probably right B) Throw it up in the comments or Twitter and I'll gather them tomorrow. I'd also love to hear some thoughts on CanWest's hopes at nationals. I've been out-of-touch with that league outside of pouring over box scores. I don't see Ottawa seeded any lower than 2nd if they win today. No way the CW champ should be ahead when they have been no higher than 5th all year and the committee will overlook a single hiccup, especially since a #4 seed would mean the two best teams in the tournament meet in the semi-finals. The only exception is if they are trying to smooth the way for Ryerson. Criteria 2: "Results of regional playoffs must be respected." I agree it's a "single hiccup" but seeding Ottawa higher than Windsor runs opposite to what the criteria says.